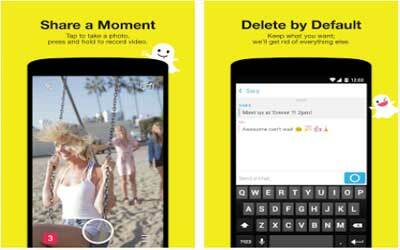 Previous version Snapchat 10.15.5.0 apk for Android will help you to downgrade or install older app easily. This is one of the best Social apps. This application is simple and what you need to do is just taking picture. You need to add text to your image before you send. You can select amount of time that people will see your photographs. After you do all steps, you can send your photos. It is very easy. Receiver will need to do some steps too before they can get the image. There will be a security measure before your friend will see your image. You can receive notifications too when your friend receives your photo. By using notification, you will be able to know whether your friend has already received your photos or images or not yet. You can also send screenshot too when you want. There are some people in the world that now use this application to communicate with other people or friends. You don’t need to send long text in your image. You are free to download this app in some sources. It is time to share your images to people without need to worry that people will use your images for other business. You can start to download snapchat for Android. Open the Snapcodes page in Settings to scan codes you’ve saved to your Camera Roll. Just like you can see who views each story. There should be a little tab for comments too. People should be able to send little comments in the snaps that only you can see and reply if you want to.